New York has put on her Sunday clothes as the city is getting ready to celebrate the 200th anniversary of the 1812 War and the Fleet Week, says New York Daily News. The parade of tall ships kicked off on Wednesday when the New York Harbor was invaded by a flotilla of vessels and thousands of Marine soldiers. This year’s edition of the Fleet Week is all the more special as it will be held around the same period as the OpSail 2012. A new edition of Operation Sail was organized in 2012 in order to celebrate the bicentennial of the 1812 War and the creation of “The Star-Spangled Banner”. This means that there will be many ships sailing up and down the Hudson River and numerous Marine soldiers visiting New York this weekend. The arrival of the ships was welcomed by large groups of people sitting on both banks. In addition, two dozen U.S. and Canadian jet fighters were creasing the skies to make the spectacle even more attractive. The majority of people who were present at the show on Wednesday told reporters that they wanted to welcome the American troops and thank them for all the efforts they make to protect the country. Jackie Corbin, however, was twice happier than most people present at the ceremony because she was about to welcome her 22-year-old son, Marine Lance Cpl. Ryan Corbin after a tour in Afghanistan on the USS Wasp. As soon as the ships docked, the harbor was almost entirely occupied by 6,000 soldiers wearing white uniforms and navy berets. They were all happy to return home, especially Petty Officer Second Class Angel Garcia who is from Bronx. Garcia was excited to see his family and to be able to eat his first hot dog with onions after one year. Like him, Marine Lance Cpl. Dennis Cox from Harlem was glad to bring all his Marine friends to his hometown. The ships will remain in New York for one week. People will be able to visit them without paying additional fees. 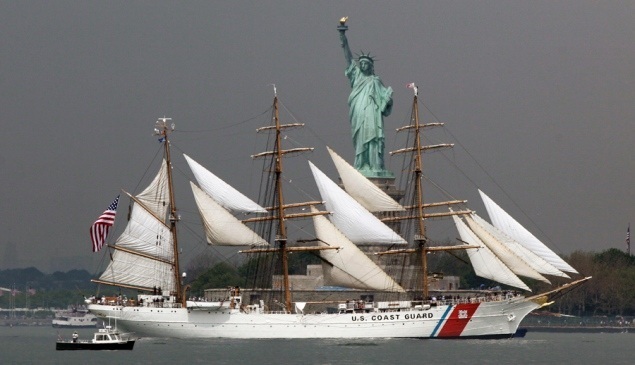 The OpSail 2012 will then, move to New Orleans, Norfolk, Baltimore, Boston, and New London.